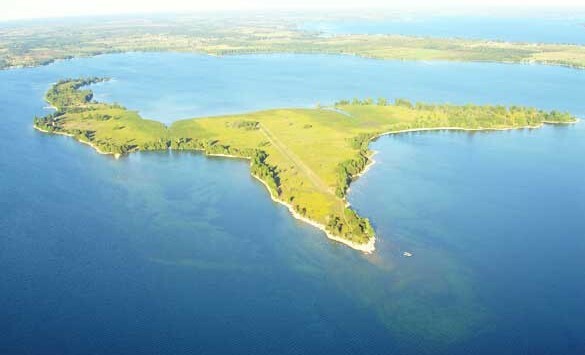 Absolute Auction: Fox Island – 263± Acre Island – Woltz & Associates, Inc. 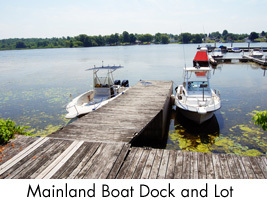 Boats depart from Martins Marina 10:00 AM to 5:00 PM and on Day of Sale beginning at 9:00 AM. The History: This incredible wonderland of islands, wildlife, fish and game was discovered in the early 1600’s and was known to the natives as the “Garden of The Great Spirit.” This beautiful island is one of the last remaining, wholly owned islands of The Thousand Islands Region in the St. Lawrence River/Lake Ontario area. It was owned for years by the late Governor Horace White who purchased the Island in 1905. 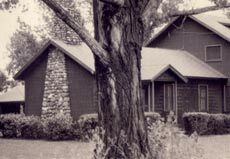 The lodge dates back to the turn of the century as well as many of the other support buildings. Fox Island has been a private retreat to governors, senators, politicians and people of notoriety and has been unaccessible to the public, having only 4 owners over the past 100 years. 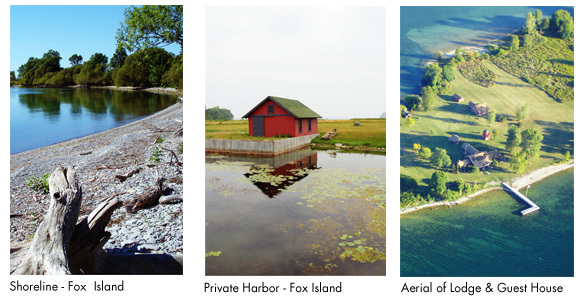 Well known for its magnificent duck hunting and fishing, Fox Island offers something special with the ownership of its own duck marsh, which was obtained from the state of New York in 1906. 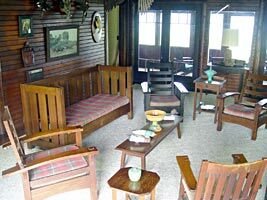 The Antiques: This will be a rare opportunity to purchase over 40 pieces of Gustav Stickley furniture in situ at the Fox Island hunting lodge. 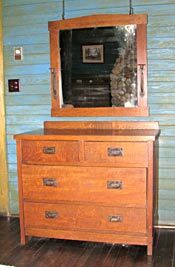 It was originally ordered for Governor White and three partners who bought four of every piece of bedroom furniture directly from Gustav Stickley in 1905-1910 to furnish the lodge. 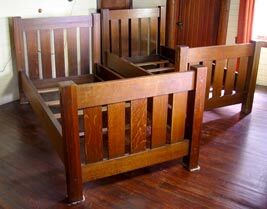 Included are 3 sets of twin beds, chests, mirrors, chairs, 3 Morris recliners, 2 porch swings, settle bench, etc. An abundance of other important items to be auctioned including artwork and the original leather mail pouch for the island, from the early 1900’s. 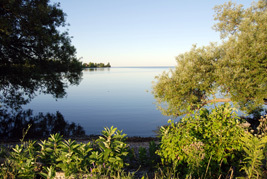 Fox Island is located at the Eastern end of Lake Ontario at the headwaters of the St. Lawrence River, where you enter the famous Thousand Islands region. 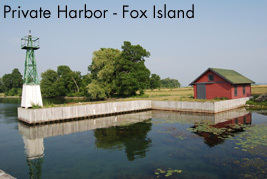 Fox Island offers you peace and tranquility, an escape form the hustle and bustle of every day life. 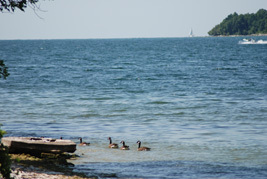 The island is minutes by boat from the mainland, close to Cape Vincent, NY. 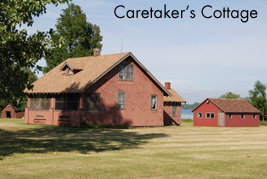 The village of Cape Vincent is quaint and full of history, dating back to 1615. This area is known for its fantastic fishing. 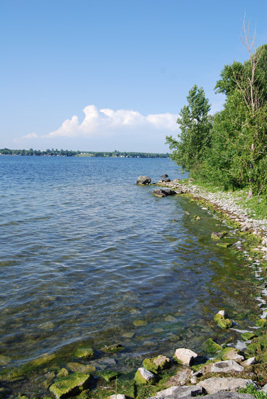 Anglers come from all over the world to fish the St. Lawrence for bass; walleye, pike and muskellunge; in addition to Lake Ontario which is stocked with trout and salmon. All this, literally outside your front door! Fox Island continues a century old reputation as one of the Northeast’s finest water fowling destinations. 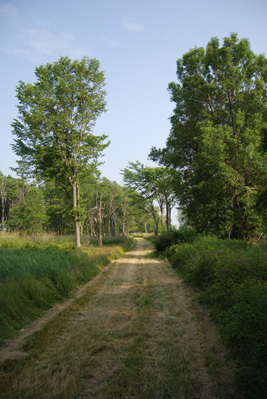 Fox Island is over 260 acres of rolling pastures, dense hardwoods and 6 miles of pristine shoreline with deeded native marshes. 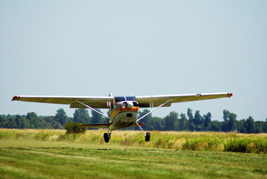 This insures privacy and manageability for the serious waterfowl or nature enthusiast. 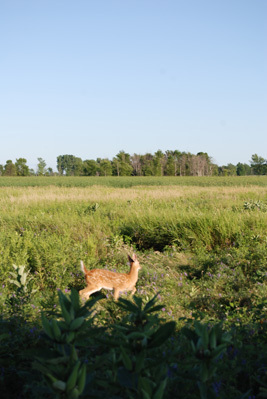 There is a resident herd of white tail deer and just recently, several families of wild turkeys have inhabited the island. The Thousand Islands are easily accessible by boat where one can experience the turn of the century summer mansions and visit the magnificent Boldt Castle. 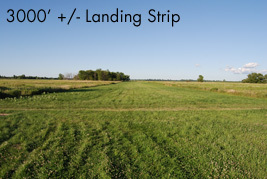 Air Strip: 3,000 ft. private grass landing strip located on the island. 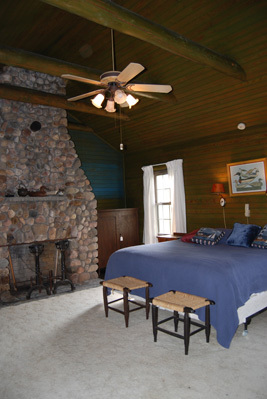 Renovated lodge (circa 1905) with three native stone fireplaces, 8 bed rooms and 5 baths, large kitchen, formal dining room, living room and game room, wet bar with ice maker, hunting and fishing storage room, and laundry room. The kitchen has a large stove top, 2 ovens, dishwater, microwave, garbage disposal and 2 refrigerators. The Guest House has 4 bedrooms, 1 bath, and kitchen with appliances. Harbors & Docks: Large front dock and mainland dock recently constructed with 70 year steel pilings and pressure treated staving. Newly constructed protected harbor and docks. Outbuildings: Large steel storage barn for maintenance equipment, boats, etc. Harbor house, Decoy house, Pump house. 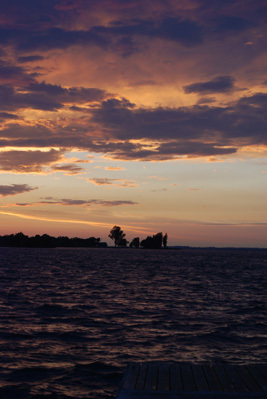 Fox Island is one of the last largest privately held islands in the 1000 Island region of the St. Lawrence River and Lake Ontario. With it’s expansive accommodations, and complete furnishings, combined with a private mainland access tract located only minutes from the island, make this a truly unique and enchanting place. All of the interior furniture is original to the property (early 1900s) to be sold at auction with majority being Gustav Stickley. Driving Time a little less than 2 hrs from Syracuse, NY. Take 81 North to exit 46 (Coffeen Street/Airport). At the exit ramp, turn left for about 2 miles into Paddy Hill. Just past the Nice N Easy Gas station, get in the right lane and turn right onto Route 12E. This will go over the Black River to a stop sign. Turn left, drive through Brownville, Limerick, Chaumont and Three Mile Bay. 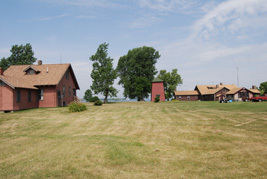 In Three Mile Bay, you will pass the fire department and cemetery (on your right), from this point drive for approximately 4.4 miles. At this point you will see a green sign for Mud Bay, and a blue sign for Martins Marina) turn left here onto Bates Road, take this all the way to the stop sign. At the stop sign turn right past Martins Marina, up the hill and turn left onto Humphrey Road. Drive down the road approximately one mile all the way to the end to Martins Marina Pier II. Martins Marina for boat rentals: 315-654-3104. PROCEDURE: The property will be offered at ABSOLUTE AUCTION. BUYER’S PREMIUM: A 5% Buyer’s Premium will be added to the final bid price to determine the contract purchase price. A 15% buyer’s premium shall be added to the high bid to determine the final selling price for any antiques and personal property sold. DOWN PAYMENT AND CLOSING: 10% down payment on the day of auction with the balance due in cash within 60 days at closing. The down payment may be made in the form of cash, cashier’s check, personal check, or corporate check. Personal and corporate checks should be accompanied by a letter from the bank on which the check is written stating that the account is a current account and in good standing with the bank. BIDDING IS NOT CONDITIONAL UPON FINANCING, so be sure you have arranged financing, if needed, and are capable of paying cash at closing. PAYMENT FOR ANTIQUES AND PERSONAL PROPERTY: Payment in full day of sale by cash, or approved check. Any customers paying by check and unknown to Ken Farmer Auctions will need to supply a bank letter made out to Ken Farmer Auctions on original bank stationery. 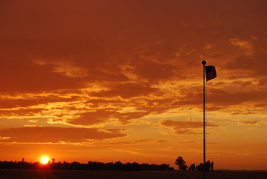 REAL ESTATE TAXES: To be prorated at settlement. PROPERTY INSPECTION: Inspection dates have been scheduled and will be staffed with auction personnel. Absolutely no access to the property is allowed without the Seller’s authorization. Further, Seller disclaims any and all responsibility for Buyer’s safety during any physical inspection of the property. No party shall be deemed an invitee of the property by virtue of the offering of the property for sale. This property is only accessible by boat and all bidders and visitors will be asked to register on the mainland before boarding the boat to the island for inspections and day of sale. ACREAGE: The property is being sold by the boundary and not by the acre and is estimated as 263± acres based on existing maps and deeds. 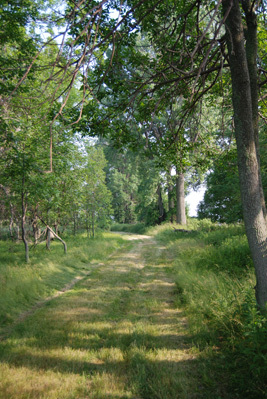 The conveyance will include 1/2± acre and a private dock located on Humphrey Rd. 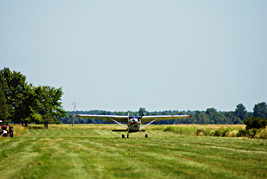 near Martins Marina, Mud Bay, Cape Vincent. BROKER PARTICIPATION: A 2% Buyer Broker fee for properly registered Buyer’s Agents will be paid to the appropriately licensed real estate broker whose prospect successfully closes on the property sold in this auction. The commission is based upon the Contract Purchase Price at the auction and will be paid at closing. Brokers must strictly follow all guidelines set by Schrader Real Estate and Auction Co., Inc. and must be registered by Wednesday August 22 , 2007 at 5:00 p.m. eastern daylight time. Broker Participation Form (PDF format). DISCLAIMER AND ABSENCE OF WARRANTIES: The information contained herein is subject to independent verification by all parties relying on it. No liability for the accuracy of the sales brochure, marketing materials, or bidding packets or for any errors, or omissions herein is assumed by the Seller or the Auction Company. Announcements authorized by the Seller at the Auction podium during the time of the sale will take precedence over any previously printed material. The property is being sold on an AS IS, WHERE IS basis, and no warranty or representation, either expressed or implied, concerning the property is made by the Seller or the Auction Company. Each potential bidder is responsible for conducting his or her own independent inspections, investigations, inquiries, and due diligence concerning the property, including without limitation, environmental and physical condition of the property. Conduct of the auction and increments of bidding are at the direction and discretion of the Auctioneer. The Seller and Selling Agents reserve the right to preclude any person from bidding if there is any question as to the person’s credentials, fitness, etc. All decisions of the Auctioneer are final. Buyers assume all responsibility for any antiques and personal items purchased and for the removal and storage of same.